“Vanity of vanities! All things are vanity!” (Eccl 1:2). So says Qoheleth, the Preacher, the protagonist of the Book of Ecclesiastes, the most unique book in the portion of the Old Testament classified as wisdom literature. As “king of Jerusalem,” the Preacher imparts to the reader his musings on life and death, which to him are the same. “One generation passes and another arrives, but the world remains the same” (1:4). His book is concerned with the purpose and value of human life. A natural pessimist, the Preacher expresses the supreme degree of futility and the emptiness of human existence. Who could not relate to that? 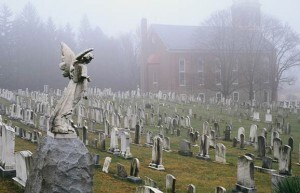 In the Roman Catholic Church the month of November is the traditional time to visit the graves of loved ones, as is the anniversary of their deaths. Autumn is the dying season, when the trees shine like rainbows in September and October until November arrives and the leaves pass away and the tree trunks and branches are shellacked black by chilly rains. Recently I visited St Peter’s Cemetery where my mother and her parents are buried in plots overlooking pumpkin patches and blueberry fields. This year marks the 25th anniversary of the death of my mother, Sylvia, from lung cancer. The previous year her parents, Conrad and Alice, also died from lung cancer within two months of each other. Sylvia—Latin for “garden served as a nursemaid to them and when she died shortly afterward I convinced myself that there was no such thing as a loving, merciful God. Who would care and what did it matter? Qoheleth was right about that: all is vanity and a chase after the wind. A live dog is better than a dead lion, so sayeth the Preacher. The Book of Wisdom, written about 100 years before the birth of Christ, offers an alternative to the Preacher’s point of view on life and death. The anonymous author writes: “The souls of the just are in the hands of God, and no torment shall touch them. The seemed, in the view of the foolish, to be dead; and their passing away was thought to be an affliction, and their going forth from us utter destruction. But they are at peace” (3:1-3). These verses are typically applied to martyrs and used frequently in the Mass of Christian Burial. Veneration of the dead is a time-honored tradition in our Church. On All Saints Day we honor the holy men and women who have bushwhacked through the trappings of life to unite themselves with Christ. On All Souls Day we commemorate the faithfully, or not so faithfully, departed who pray for us beneath the purifying light of purgatory as we pray to hasten their entrance into the eternal realm of the Trinity, Mary, the angels, and the saints. At the cemetery I knelt by the graves and cleared away the mud and the dead leaves covering their footstones. I couldn’t understand, wouldn’t accept, why my three favorite people in the world suffered so much as they lay bedridden in hospice beds beneath crucifixes hanging above them on the wall. They could not see the crucifixes but I imagined that it offered some comfort by knowing they were there. My mother helped to care for her parents and heard my mother and father talking about them, using the words biopsy, malignant, radiation, and chemotherapy. My mother couldn’t smoke in their apartment because of the oxygen tanks. The pill bottles covered the tables by their beds and their skin was scorched from the radiation treatment. Mercifully my grandparents passed away, but the images of their suffering were reinforced the following year when my mother got sick and died two months after her diagnosis. I have worked hard to supplant the grim reality I witnessed with recollections of the good moments my family shared with my mother before she died. Sylvia was an interior decorator and an antique dealer. She could be described as the worthy wife in the Book of Proverbs. “She picks out a field to purchase out of her earnings, and she plants a vineyard. … She enjoys the success of her dealings. … She reaches out her hands t the poor and to the needy.” (31:16, 18, 20). Sylvia devoted herself to making our home welcoming, warm, and inviting, the kind of home displayed on the pages of House Beautiful and Better Homes and Garden. In my mid-30s I returned to the Church and felt called to be a priest. I studied the Scriptures and the Catechism and my perspective on Christian death changed. Qoheleth had his point of view. I came to understand that, though my mother and her parents suffered terribly I understood that they obtained the desire of the Christian: to be tried like gold tested by fire in purgatory and to be raised on the Last Day. Their deaths were not in vain and I allowed myself to make peace with God. The Church established the month of November for the soul as a perpetual commemoration in the 10th century, during the Dark Ages. As Catholics we celebrate the birth into eternal life of our beloved dead, the birthright of the Christian received at Baptism. We can communicate with loved ones beyond the grave through Scripture, the sacraments, and through prayer. The perpetual light of the Lord shone upon the souls of the just even during the Church’s darkest moments, in an era when it seemed that the world was ending because of the marauding barbarian tribes. Gregory the Great convinced Attila the Hun to spare the city of Rome, and the pope preserved the Christian heritage and the advancement of art, liturgy, and education. A great light shone on the Church even in the darkness. As a boy I liked to visit cemeteries. My parents worked at city hall, a block from the parochial school I attended. After school I waited for my parents to finish work and walked through the cemetery between the city hall and the school. I read the names and the dates on the headstones, some dating back to the 18th century, and the iron-clad crypts bearing family inscriptions. I found comfort and grace meditating upon the lives of the dead. What were their lives like? How did they spend their days? Did they die in a state of grace? Were they in heaven or waiting it out in purgatory? The gravestones told the story of who they were but only God knows the state of the soul at death. These supernatural destinations don’t have zip codes and can’t be located on Google Maps but they are real. Purgatory is the state of cleansing a soul undergoes when they have died in God’s friendship. The Church encourages the faithful on earth to assist these souls through prayer and penance. We can pray the souls out of purgatory into heaven and they pray for us while they await the Beatific Vision. Heaven is a state reserved for those who, having attained salvation, enter into the glory of God. Hell is the realm of Satan and his fallen angels and for those who willingly reject God. It is a condition of sensory pain and separation from God that never ends. The New Testament speaks of fire and darkness related to hell but God predestines no one to go to there (CCC 1037). “He who does not love remains in death” (1 Jn 3:14). We cannot be united with God unless we freely choose to love him. My mother and her parents were not church-goers and knowing that I wondered whether they were saved or damned. Today when I think of them on their death beds I feel confident that the made their peace with God, were cognizant of the crucifixes hanging over their beds. Bernadette, my godmother and my mother’s best friend, told me that my mother prayed one “Hail, Mary” a day. Just one. Maybe more. Who knows? I hinged my hope on that knowledge and hoped it was sufficient for her to obtain salvation.